Compact design for tropical climate in M.E. Our reputed entity is engaged in supplying Sanyo Air Conditioners. 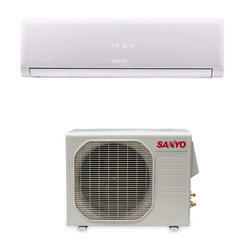 We are amongst the most reputed names in the industry, offering Sanyo Air Conditioner. Our company has been successful in winning appreciation from the clients as one of the most prominent names in the trading of Sanyo Air Conditioner. Introducing the all-new HiPer+ Packaged Airconditioners - high performance machines even at high sensible loads and at 45 degrees C ambients. They are specially designed to aircondition IT/ITES/BPO premises situated in cities with harsh summers. We are well known dealers of AC and air conditioner in Hyderabad, who offer their clients with branded air conditioning units. Some of the AC brands in which we deal includes Panasonic, Daikin, LG, o-general, hitachi, samsung, carrier, voltas Sanyo etc. We are a top notch supplier of Sanyo Air Conditioner. T2 TROPICAL COMPRESSOR operations with outside temperature up to 52°c. High Power Operation :- If not in Auto Operation, the unit operator at Maximum output for 30 minutes, regardless of the desired temperature. The fan speed 51 stop above high.